Caspian Oil&Gas 2016, the 23rd international exhibition and conference, the largest energy sector event in the Caspian region, will take place from 1-4 June 2016 at Baku Expo Center. 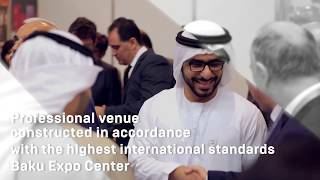 Over more than two decades, the exhibition has recognised as the platform for establishing reliable business relationships, closing valuable contracts and successfully implementing projects. Each year, the exhibition is attended by more than 10,000 local and international professionals. The annual participation of Ilham Aliyev, the President of the Republic of Azerbaijan, in the exhibition’s opening ceremony testifies to its high status. The Ministry of Energy of the Republic of Azerbaijan and the State Oil Company of the Republic of Azerbaijan (SOCAR) both show invaluable support for Caspian Oil&Gas. The exhibitions and conference are organised by Iteca Caspian and its partner ITE Group. The exhibition and conference bring together high-ranking guests who take part in the opening ceremony. Among VIP guests this year will be Robin Dunnigan, Deputy Assistant Secretary for Energy Diplomacy Bureau of Energy Resources (USA), Ms Emma Nicholson, Baroness Nicholson of Winterbourne, PM’s Trade Envoy for Azerbaijan, UK, Ms Marim Valishvili, Deputy Minister of Energy of Georgia, and high representatives of “Uzbekneftegaz”, “Gazprom”, “Gazpromneft Sakhalin” “BP”, “Statoil” and other companies. Caspian Oil&Gas 2016 will bring together 240 companies from 30 countries including Azerbaijan, Belgium, Spain, Italy, Kazakhstan, China, the Netherlands, Poland, Portugal and other. Germany and Italy will hold national stands. Newcomers, making up 15% of exhibitors, include companies from the UK, Portugal, Romania, the USA and elsewhere. In total, international companies will cover 63,7% of the exhibition space. The event’s status is reaffirmed by its line-up of leading Azerbaijani companies and leaders in the oil and gas industry sponsoring the exhibition and conference. Traditionally Caspian Oil&Gas 2016’s General Sponsor is SOCAR, the Gold Sponsors are BP and Petronas, and the Silver Sponsor is Bos Shelf. Among other sponsors are Azeri M-I Drilling, Caspian Marine Services, Caspian Drilling Company, Global Energy, GMS, AZFEN J.V., Hydromashservice, RussNeft, SOCAR Polymer, Tekfen Construction. The General Media Partner is Caspian Energy International Media Group. Caspian Oil & Gas Exhibition is also supported by the leading local and foreign news agencies, magazines and trade publications. Exhibiting companies will present a wide range of equipment, services, innovative technologies for oil production and transporting energy resources, storage systems for oil and gas, platforms and floating drilling rigs, pipe laying and pipe security systems, and services. A series of stands will present technologies for fuel purification and production, from raw materials to the finished product. A large area will be dedicated to companies offering raw materials for the chemical industry and chemical production. Iteca Caspian continues its support for art and traditional craftsmanship in Azerbaijan by presenting a display of Azerbaijani national headscarves “kelagai” and an exhibition of pictures from the charity Damla at Caspian Oil&Gas. The Caspian Oil&Gas conference, the traditional platform for discussing current topics in the oil and gas industry will take place from 2-3 June at the JW Marriott Absheron Baku hotel. Bringing together leading companies’ senior managers, representatives of related ministries, and renowned industry experts, the oil and gas forum will provide the opportunity to share opinions on current issues in the oil and gas industry. Key discussion topics will include “The Caspian region’s gas infrastructure: the state of implementing key projects in the region”, “Shah Deniz-building on 20 years of success”, “Financing and implementing major oil and gas projects”, “Expanding Azerbaijan’s energy resource base”, “Training professionals for oil and gas projects”, “Ensuring environmental and industrial safety”, “An overview of petrochemistry and oil refining in Azerbaijan and their development prospects”. Around 400 delegates from more than 30 countries will take part in the conference. More than 40 speakers, including leading experts, representatives of government bodies, and directors of major oil and gas companies from various countries, will speak on key issues in producing, managing and transporting energy resources amid low oil prices. Natig Aliyev, the Minister of Industry and Energy of the Republic of Azerbaijan, will take part in the plenary session Azerbaijan’s Role in Ensuring the Supply of Energy to Europe. Conference speakers will include Rovnag Abdullayev, President, SOCAR, Gordon Birrell, Regional President, BP Azerbaijan – Georgia – Turkey, Marco Alverà, CEO, Snam, Jeremy Huck, CEO, Nobel Upstream and other speakers. For the first time, the conference will cover the subject of staff training for oil and gas projects. At the 6th session, professionals will discuss market players’ obligations regarding staff and social responsibility, developing talent search systems, educational programmes and other technologies to help professionals be more effective, creating efficiency assessment systems and a reserve of personnel, and much more. Khalik Mammadov, Vice President for HR, IT and Regulations at SOCAR, will moderate the session. Speakers will include representatives from BP, SAP, Petronas, and Baku Higher Oil School. The line-up of sponsors is also noteworthy; the conference’s General Sponsor is SOCAR; Gold Sponsors are BP, General Electrics and Snam; Silver Sponsor are Inpex and McDermott; and Bronze Sponsors are Caspian Geophysical, Dentons, Nobel Upstream, SAP, Schlumberger, Statoil, Total, and GMA Petroleum. The latest news on the Caspian Oil&Gas exhibition and conference will be placed on the official websites www.cog.az and www.oilgasconference.az. A number of publications will be issued for the exhibition and conference including the official exhibition catalogue with detailed descriptions of exhibitors and their contact details, materials for the conference with speakers’ biographies and descriptions of participants’ businesses. This year, there will also be three editions of the Caspian Oil&Gas official newspaper published, with interesting reports and news items. The sponsor of Daily News: Caspian Oil&Gas 2016 is Azeri M-I Drilling Fields. The exhibition and conference provide suppliers with the opportunity to talk to customers and colleagues, to present technologies and services in action, to acquire useful business contacts, and to get new information and technologies, expanding the opportunities for international collaboration in the oil and gas sector.